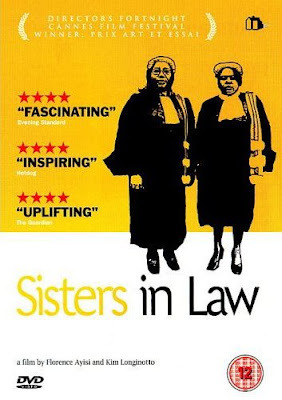 We've just finished watching Sisters-in-law, a documentary set in Cameroon following several cases that pass through the court of a small town. Its a wonderful film full of the minor tragedies and joys of everyday life and the raw feminism of the central characters. It also shows the artificiality of national boundaries in West Africa: most of the film could be Nigeria. i watched it ages ago on channel 4. very interesting. for once we hausa people were on show.i cudnt believe his hausa wasn't difficult at all to understand. certainly a lot clearer than people from Sokoto. yes indeed. artificial contruct of africa. even the judges accents were nigerian-ish (i used to believe cameroun was all french coz all the ones who came to my state were from the french speakin parts) so ignorant. Yes, they showed this on British television a while ago. It was fascinating, but not surprising, because it's well known that English is widely spoken in Cameroun. They even have their own version of pidgin English very similar to ours..
where can you watch it, can you see it online? I cannot sayit blew me away...but real issues were raised that we will have to adress as a cociey at some point. Difference btw Nigeria and Cameroun in the context of the film is academic.